Clearly, crafting is not a priority right now and I'm at peace with that. However! I still find time to make really tasty food. We have to eat after all, and it might as well be good. Some of the things we've made lately are slow cooker pulled pork, egg salad (dill makes this amazing), and cracked wheat muffins. 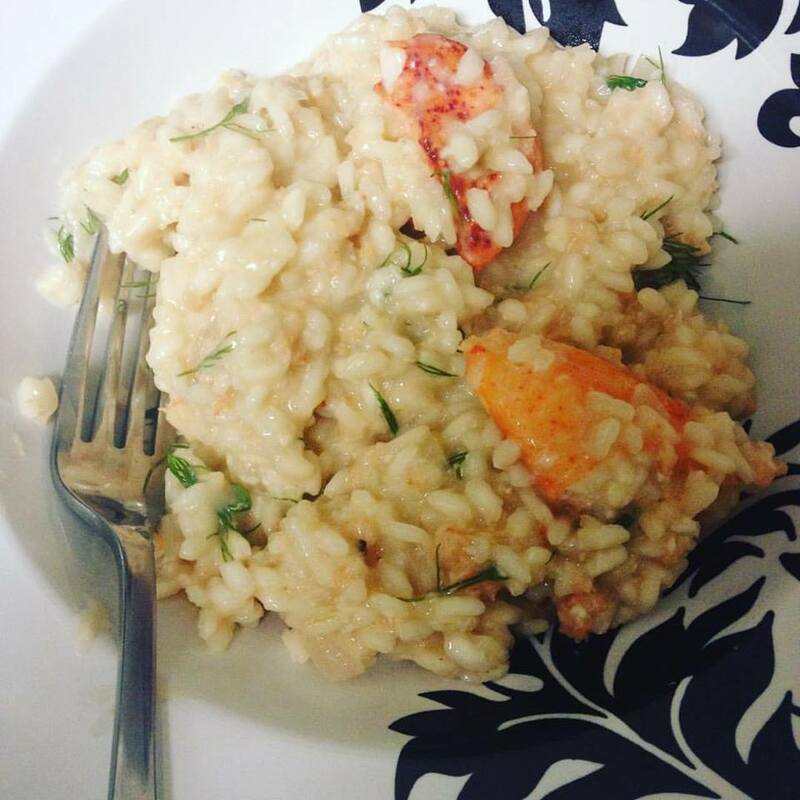 Last Saturday, Blake and I made lemony lobster risotto with dill and Parmesan and it was SO good. We had a gift code from PeachDish.com for a free date night meal kit, so all the ingredients were shipped to us in a refrigerated box, all measured out and ready to go. They also sent the recipe so that we could make it again once we acquire the right ingredients. Blake and I teamed up in the kitchen and the results were amazing. It's fun to cook together. At least one night each weekend, we like to make pizza. We've decided that on most weekends, Blake needs to stay home and study one of the nights, so that night we make homemade pizza so it's still something to look forward to. We bought a pizza stone with some wedding money a couple of years ago and we definitely make use of it. 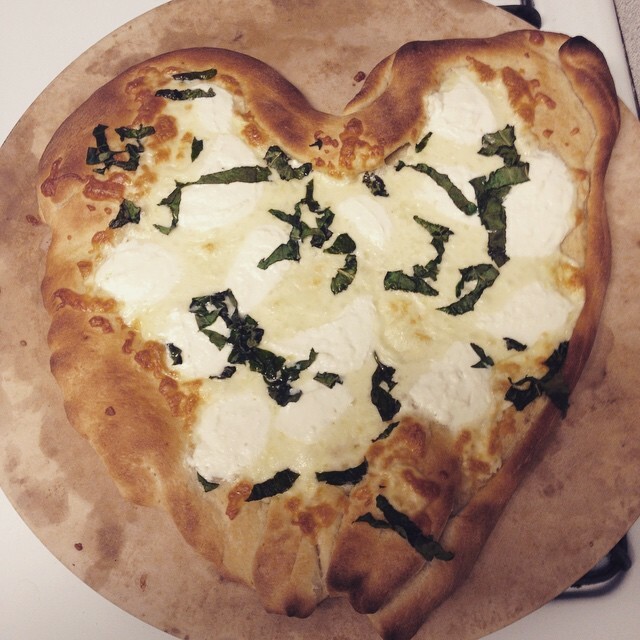 This pizza was made using canned dough, but we make our own now. And sometimes our plans go awry. One Sunday, back in February, we came home from church to a home without power, so the beef stroganoff in the crock pot was not ready. 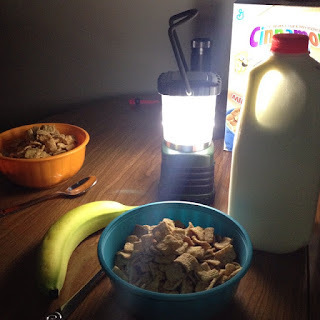 Luckily, we had some cold cereal on hand (not a usual occurrence) and decided to eat it by lamplight. The power came back on during my second bite, but Blake got up, turned off the lights, and we finished eating in the mostly dark, just because we could. I had a banana too. Blake does not like bananas. I'm looking forward to making a delicious Thanksgiving dinner tomorrow. I toasted some homemade bread this evening that Blake made a week or so ago so that we'll be ready to start our preparations with slow cooker stuffing! Any good meals at your house lately? When my mom was in college a dinner by stove light meant that the roommate in charge of dinner that night had screwed it up and they were going to be better off not seeing what they were eating. Cooking adventures are a lot of fun. Especially because you don't have to leave the house for them. I love that! My family has a recipe called Stewed Woolies because of a roommate story. It's a variation on Sloppy Joes and the story goes that my mom's roommate, whose last name is Wooley, was taking so long to cook that if she didn't hurry up they would have Stewed Woolies for dinner. I have no idea if anyone else involved in the story still calls them that, but I do!